Understand the OIC process and maximize clients’ chances of settling back-tax debt. Know why the IRS accepts—or rejects— an OIC and be better equipped to come out on the winning end. 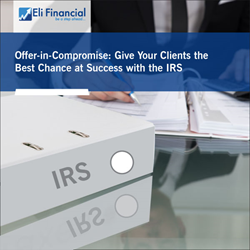 Eli Financial, a division of audio conference and corporate education leader ProEdTech, will host the live webinar “Offer-in-Compromise: Give Your Clients the Best Chance at Success with the IRS” with industry veteran Eric Green on Thursday, June 7, 2018 at 1:00 pm ET. Securing an Offer in Compromise (OIC) with the Internal Revenue Service (IRS) can be an uphill battle, because the conditions to qualify are extremely strict. Every year, tens of thousands of OICs are filed, but fewer than 45% are accepted. To authorize an OIC, the IRS requires certain critical conditions. That’s why clients seek help from tax professionals to help lower their back-tax bill. Get prepared to give clients the best chance at a favorable IRS evaluation. Join Eric Green as he guides tax professionals, CPAs and enrolled agents, and finance and accounting professionals through the OIC filing and evaluation process. Green will cover the various forms of OICs, explain how to properly calculate client’s Reasonable Collection Potential (RCP), and reveal strategies to give clients the best shot at settling their tax debts. Using a real-world case study as an example, Green will explain exactly how the IRS assesses the OICs it receives—and how the agency calculates RCP. ProEdTech is a leading source of knowledge and training for professionals in over 15 industries, serving individuals, businesses and their employees around the globe. It offers webinars, online conferences, seminars, boot camps, books, DVDs, white papers, industry reports and other learning tools from industry experts and insiders who provide a fresh perspective on key issues, trends and regulations in order to simplify governance, risk and compliance (GRC) for enterprises and industry professionals. ProEdTech’s AudioEducator webinars offer updates, regulatory knowledge and information on the latest news in various medical specialties, as well as coding and billing updates, and analysis of regulations that affect ambulatory surgical centers, home health, long term care and hospice facilities, hospitals and healthcare systems, health insurers and physician practices. Webinars are also offered through AudioSolutionz in the technology, human resources, construction and housing, ICT and telecom, manufacturing, consumer packaged goods and retail, safety and security, transportation, energy and environment, education, trade, and chemicals industries. ProEdTech’s Eli Financial platform offers tax and banking professionals, focusing on providing high-quality online training products customized for U.S. lenders and tax practitioners that include the latest updates from the IRS, CFPB and other regulatory authorities. ProEdTech regularly provides professionals the opportunity to get answers to their most complex questions directly from experts, without having to attend costly live conferences. To learn more, visit: http://www.proedtech.com/.